Unfortunately, there is currently no simple tapeworm test for horses available in the U.S.A., and when tapeworms are present in your horse they can cause damage to your horse’s health. A test previously available, Equisal from a U.K. based company, was deemed too risky to use in the U.S.A. due to the possibility that the folks processing the samples for results could contract rabies or other diseases from the saliva samples. So if you cannot test your horse herd for tapeworms what protocol should you follow and if you do nothing, what medical risks are involved in tapeworm infection? 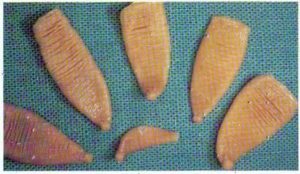 Tapeworms can be responsible for colic in horses as they attach themselves to the mucosal lining of the alimentary canal and cause an inflammatory response that can result in ulceration and fibrosis. Tapeworms are commonly sited at the junction of the large and small intestine. The presence of a high population of tapeworms is generally required to cause ileocecal intussusception or intestinal rupture, or to cause peristalsis of the gut, so it is important to mitigate the number of tapeworms present and to treat your horse to protect against the tapeworm population becoming excessive. It does not appear that a low count of tapeworms in the horse causes any major issues. All tapeworms have a lifecycle that includes intermediate hosts, notably oribatid mites that live on grass stems. Horses inadvertently ingest these mites during grazing season, and if the mites are infected the tapeworm cycle is continued in the horse to the horse’s possible detriment. Mites are not active at colder temperatures although they may survive colder temperatures, thus their active season coincides with the grazing season. For this reason the optimal time for targeted treatment for tapeworm in horses is generally recommended late Fall or early Winter, unless a tapeworm presence has been detected in the horse or in his environment, in which case a twice yearly administration of Praziquantel based dewormer should be enacted, in both Spring and Fall. 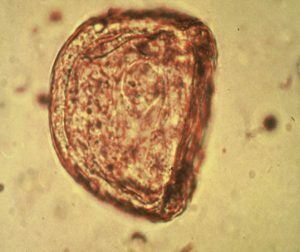 There are rarely clinical signs of a low population presence of tapeworms in horses. By the time your horse is showing signs of severe tapeworm infection such as colic pain or discomfort (pawing, trying to lay down, nipping at sides, increased flatulence etc. ), weight loss, bloating, dull coat or lack of shedding as temperatures warm up, the damage may have been done and a vet should certainly be consulted.